Don't you just like it when an idea comes out like you planned in your head! 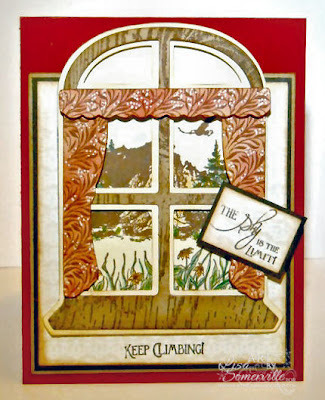 I combined the Mountain image from Our Daily Bread Designs Keep Climbing Set with the Flowers from the Dog Sympathy set to create the scene to go behind the ODBD Window Die. I made a few Cut Files with my Silhouette Cameo to work with the ODBD Die, so that I had a solid backing that matched the window to stamp on, I also created a larger Cut File for the window, to add another layer of dimension to the frame. The Window Die is the image cut from Kraft, stamped with the ODBD Wood Background. Those cute curtains you see are also from the ODBD Window Die, I cut them from Vanilla card stock, stamped with with the ODBD Vine Background, then sponged on Red Ink, and added White Gel Pen over the stamped dots. The Mountain and Flower images were colored with STAEDTLER Karat Aquarell WC pencils, blending with Gamsol. The pattern paper under the Window Die is from the My Minds Eye Honey collection. Be sure to stop by the ODBD Blog, each month they are doing a Product Focus, this month the focus is on the ODBD Window Die. For more inspiration and details about the die, be sure to check out this post. I love your card. The curtains are so lovely. I have a weakness for "window" cards. Love how you used the die, u r sooo cre8tive! I do love it when a plan pans out! This is one sweet card. The textured curtains are a fantastic touch! Awesome, Lis!!! Love the wood frame on the window and the mountain looks so cool!